Meluna user looking for a recommendation. Alright, you win. When I first started looking for a cup, I thought "What's wrong with these people? Why would they want more than one if they found their goldilocks cup?" BUT I GET IT NOW! I have a medium Meluna with a ring stem that I have used for three cycles with little to no incidents, including a heavier than normal cycle after a missed period this last month. It's great, I love it, etc etc. But I want one made of silicone now too! I've been doing research, but I'm at a loss. Do any Meluna users have a silicone cup that they find comparable? I have a low cervix and the medium fits me perfectly, I can't go longer. Is your medium meluna a soft or classic? Have you compared the dimensions at http://sizecharts.livejournal.com/ or at any of the other size charts over at the Community FAQ? 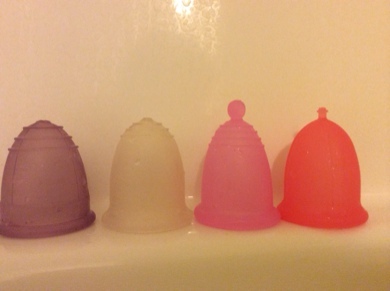 I went from silicone to the MeLuma and hated the MeLuna. The material is so different that I think you should give it a go. You may prefer the silicone. I know I do! I have three cups I use regularly! One cycle I will use one of my goldilocks cups and the next cycle, a different one will work better. For two cycles my perfect combo was the Femmecup for day one and the Keeper Moon Cup for the remainder. Last cycle I couldn't use those cups without leaks so I used my Diva Cup the entire cycle. 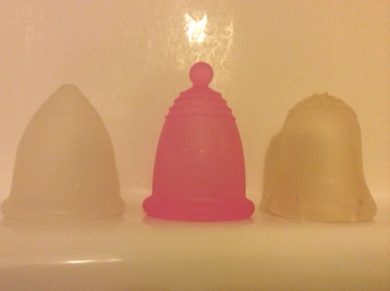 This time I used my Femmecup for day one and the Diva for the remainder. I think it's great to use many different and keep your top two faves, at least. Because from my experience, your body fluctuates. Good luck! Hehe, welcome to the world of cup hoarding. These are all cups that are similar in shape and size, with the Mamicup being a tad wider in the body, and the Si-bell also a teeeny tiny bit wider. They all open easier than the Meluna M soft. Whichever one you pick, you will LOVE it. Fleurcup have periodical 5 off sales, so i'd hold off on purchasing it right this minute until someone posts about a sale again. Si-bell and Mami and new style Natu are cheapest on coppetta-mestruale.it, but may also be available through the very awesome femininewear.co.uk website. Can't wait to hear which one you'll end up getting. I got the Eco-cup also on coppetta-mestruale.it and the Sckoon on Ebay. I totally love the Eco-cup, while the fat, fat rim on the Sckoon is a bit too much.